The Wireless Speaker Lamp is a stylish floor lamp with an internally hidden 5-1/4 full range wireless speaker. This innovative design provides full 360 sound dispersion using a patent-pending, pole piece mounting. This eliminates speaker stands, speaker wire, unsightly speaker boxes, and cutting holes in the walls for inflexible and costly speaker installations. It can be set to left or right for use in pairs as rear surround sound speakers in home theaters, providing true realistic performance without speaker localization. Or it can be set to mix to provide stereo sound from a single lamp. The first useable speaker lamp that has 100 watts of light, with superb sound …what a combination! This speaker lamp also offers a foot controlled dimmer switch. These floor lamps are equipped with one input for your choice of sources…such as mp3 players, computers, boom-boxes or a TV and one output if you would like to add a subwoofer. 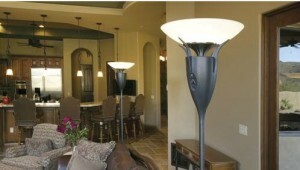 These stylish floors lamps are a great solution for rear surround sound systems. Most of all…they’re WIRELESS ! They add warmth & style to most any decor. A must have for offices, churches, bedrooms, or whole house audio. Contact us today about renting or purchasing stylish Wireless Speaker Lamps for parties, dinners, and other events.